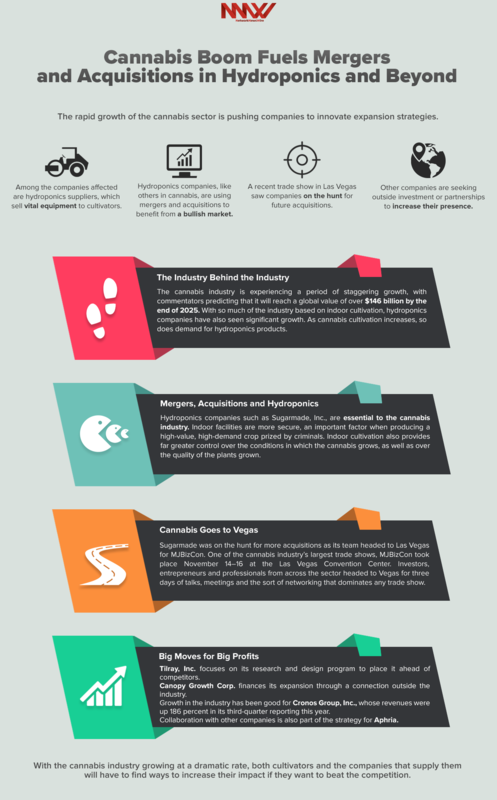 The rapid growth of the cannabis sector is pushing companies to innovate expansion strategies. Among the companies affected are hydroponics suppliers, which sell vital equipment to cultivators. Hydroponics companies, like others in cannabis, are using mergers and acquisitions to benefit from a bullish market. A recent trade show in Las Vegas saw companies on the hunt for future acquisitions. Other companies are seeking outside investment or partnerships to increase their presence. Hydroponics supplier Sugarmade, Inc. (OTCQB: SGMD) (SGMD Profile) has leaned into the current trend for mergers, with a big acquisition and open plans for future growth. Tilray, Inc. (NASDAQ: TLRY) is focusing on research and design, using public offerings to finance this work. Canopy Growth Corp. (NYSE: CGC) (TSX: WEED) has gained $4 billion in investment from a beverage company, an investment some believe will lead to a takeover. Both Cronos Group, Inc. (NASDAQ: CRON) (TSX: CRON) and Aphria (NYSE: APHA) (TSX: APHA) are relying on diverse strategies, including external partnerships, as they look to grow and succeed in the cannabis sector.